Orrick features an exclusive simple rustic design with chamfered edges, softly rounded corners, stunning sculpted handles, and flared legs. Each piece from our fantastic Orrick range showcases an exclusive simple rustic design which harmoniously brings out the natural beauty of the oak. With over twenty-five products available you'll find something for every room in your home. Whether you're looking to revamp your dining room or invest in some new bedroom furniture, the Orrick Rustic Solid Oak Range will suit a wide variety of décors from the modern to the traditional. Distinguishing features include chamfered edges, softly rounded corners and skillfully sculpted handles. Slightly flared legs offer a truly unique look to this range, which boasts an overall natural feel. Only the finest quality oak is used throughout which means no veneer, no MDF and no chipboard is ever used in any of our products. Even the backs panels are made from one hundred percent solid oak, and all drawers feature traditional dovetail joints for exceptional strength and longevity. Don't forget - we offer lots of finance options if you'd prefer to buy now and pay later. 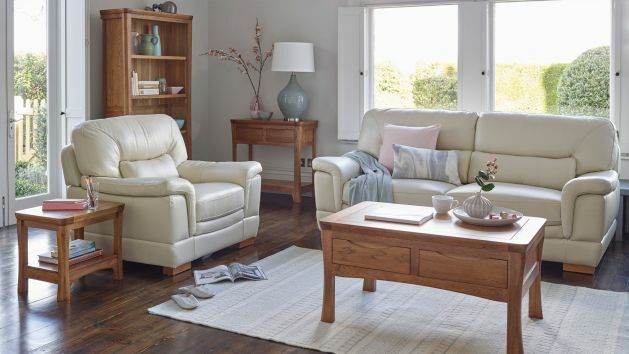 As with all of our ranges, each piece is designed to match and complement the other pieces within the collection and all of our other rustic oak furniture lines. Please note: Orrick features our popular Rustic finish; subtly tinted, this means each piece is slightly darker than items from our Natural Oak ranges.